Is this how you Go Spectre in Manhattan? If you love New York City, Pope-induced traffic jams, groundhog-dropping mayors and all — and you dig boutique hotels that just get it right, it’s hard not to fall for the NobleDEN. With rooms numbering just 54 this feels more like a private club and sanctuary space than a big hotel, the kind of place whose address you’ll only want to whisper to your closest friends. Rare is the hotel whose vibe corresponds so well to the neighborhood where it’s located; in terms of design and degree of subtle sophistication NobleDEN is pitch perfect. Though they don’t say so on the website, beds are supremely comfortable and actually come with storage space. 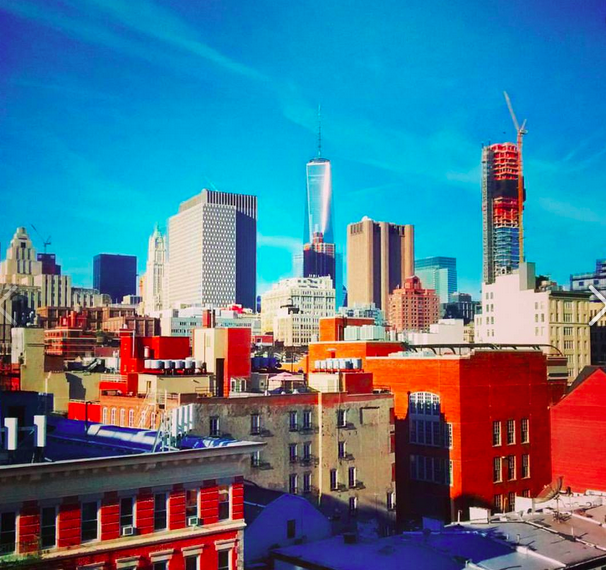 To get a sense of where you are, pop up to the roof deck for a view that sweeps uptown to the Empire State Building and (much closer) downtown to the Freedom Tower. 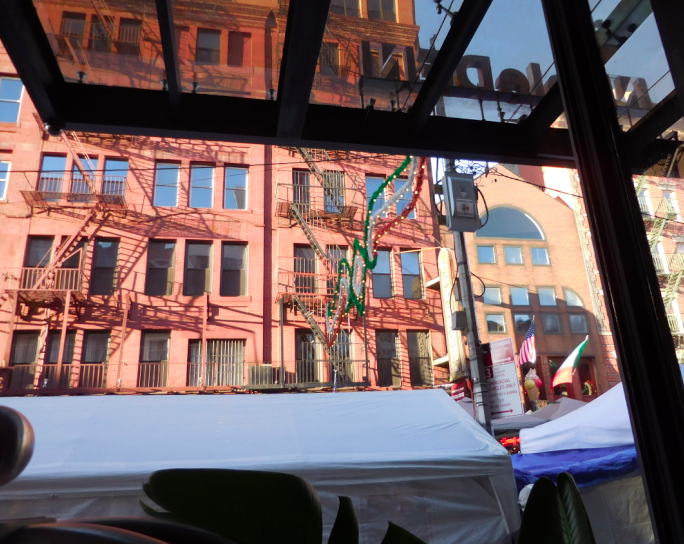 Down below, the aromas and rhythms of Little Italy will easily grab hold, and it’s right outside the glass lobby door. A stylish but understated Manhattan refuge in an exciting downtown location. New York’s cosmopolitanism is reflected in the NobleDEN from the moment you enter: leave the din of Little Italy behind as you find yourself in a fetchingly modernist cocoon of sleek Asian aesthetics: such is the high-ceilinged lobby, with just two oversized gray armchairs and a row of modular cushioned seats in different pastel colors behind them. There’s no bar and none of the noisy buzz that tends to go with one; this is a different kind of cool. 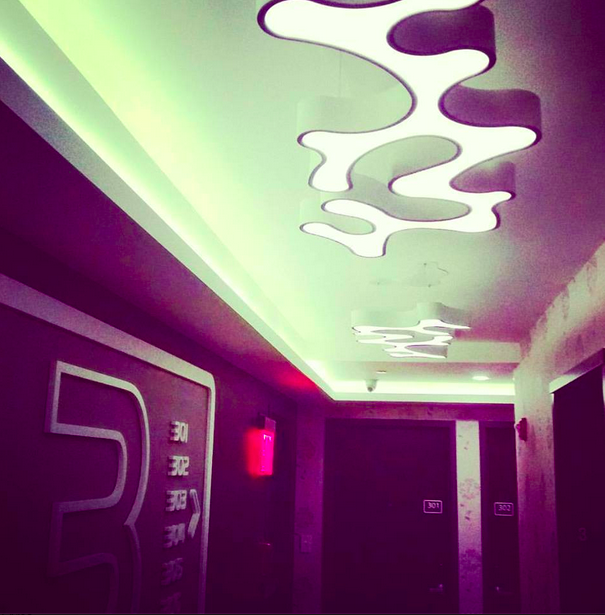 Reception staff amiably answer any question you might have about the neighborhood or tricky New York transportation. It may sound strange for a city like New York, but you really are made to feel at home, and it’s a marvelous little urban house to call your own for a while. The hotel’s crossroads location is one of its big advantages. It’s true there isn’t much left of Little Italy today, in geographic terms, but here you’re in the heart of it as well as on the border with Chinatown and the Lower East Side. Nolita and Soho are very close and you get something of those neighborhoods’ spirited groove too. 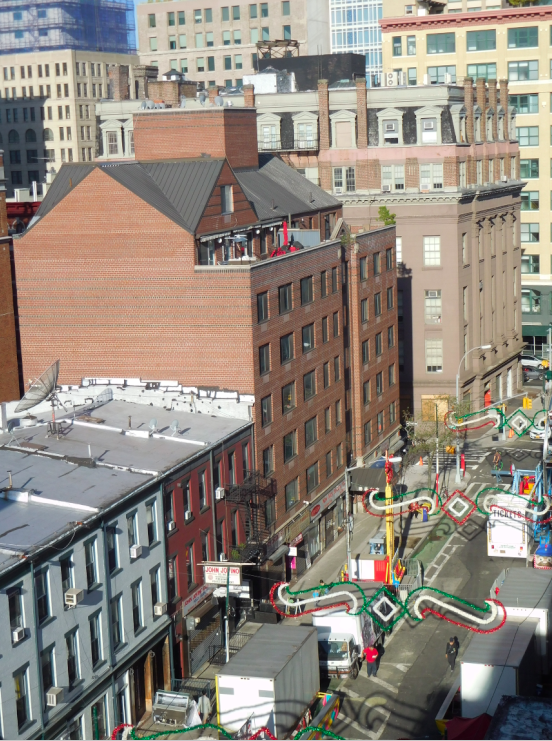 If you’ve got sightseeing in mind, the South Street Seaport and Freedom Tower are not far. Soundproofed and plush with sleek bathrooms, these rooms are winners. The original structure was demolished to build the hotel, so the feel is fresh and the guest rooms, which are immaculately clean, are soundproofed. Floor-to-ceiling windows let in natural light. Color schemes blend earth tones with subtle splashes of either orange, green or blue depending on room type and hardwood floors are standard throughout – a very nice touch. 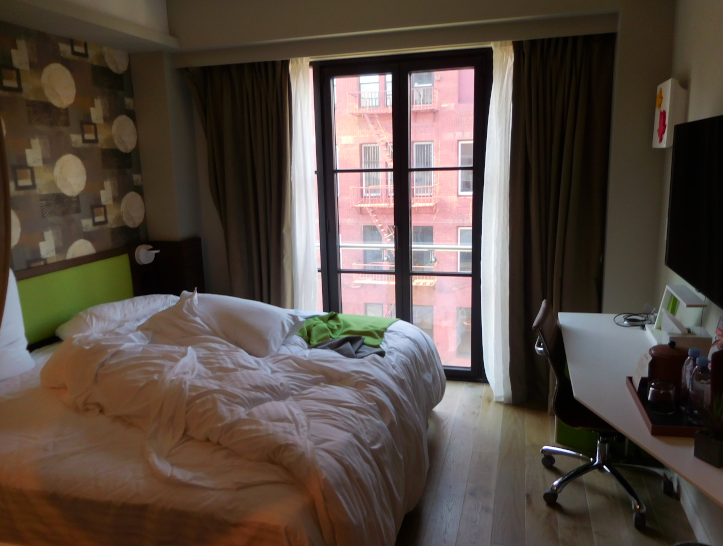 Beds and linens are luxuriously comfortable; there are also small work desks. Bathrooms are bifurcated – wide, sleek white customized wash basins with floating mirrors suspended above them are part of the bedroom space, while toilet and shower areas are separate. The showers are each outfitted with two high-tech Hansgrohe showerheads, one rainbath and one handheld with robotic water massage feature. Ok, so I didn’t make the bed. This is New York..would you have the time?? 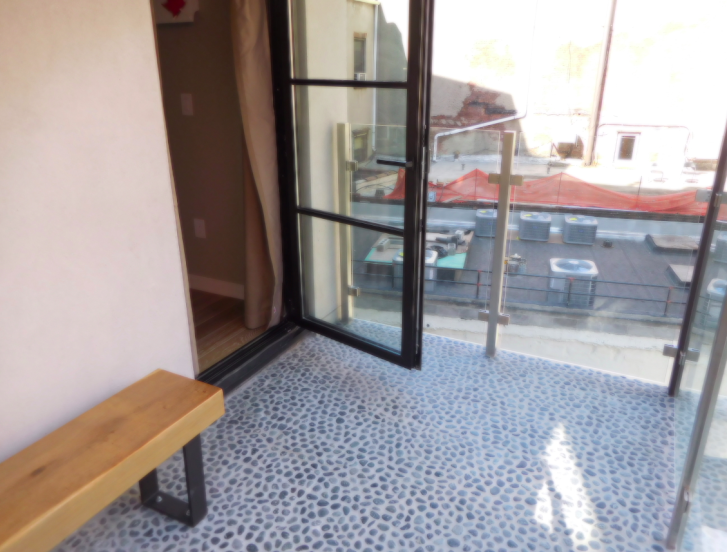 The King Juliette rooms look out onto the red brick storefronts of Grand Street. There are Double Full and Double Queen rooms as well as Double Full Balcony rooms which feature Zen-like wood-floored balconies in the rear: a rarity in New York (the King Penthouse features a sitting balcony over Grand Street). While it isn’t exactly brandished on the hotel’s website, many of the guestrooms feature balconies – even if they’re just small spaces to step outside. Tiny or not, that’s something exceptional for Manhattan, where space is ever at a premium. All rooms have minibars. The hotel has its own line of bath amenities which are fragrant and sleekly packaged. There is free WiFi thoughout the hotel. Also complimentary is morning coffee and pastries; the latter arrive on a platter every morning from the famous Ferrara Bakery right across the street. There’s no restaurant, but one is under construction. Previous Previous post: Coming soon: A kinder, gentler…Syria? Next Next post: Hail Grande (Petite) Bretagne!